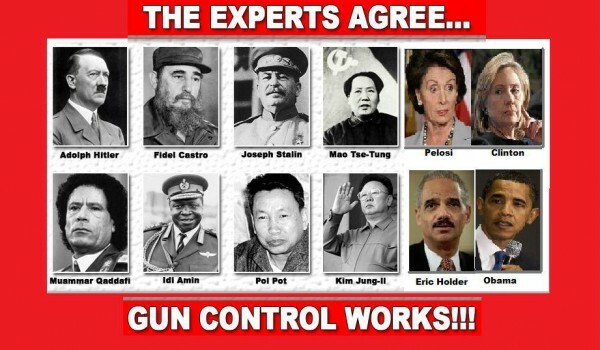 The Great Socialist Gun Grab! Tell me … how many of you really believe the government can keep you safe? How many of you will be assigned your own personal security team? Barack Obama, Diane Feinstein, Joe Biden, John Kerry, Harry Reid, and Nancy Pelosi all travel with bodyguards armed with … “gasp” … guns! Why is it ok for them to have the protection firearms provide … but not you? Are their lives more valuable to them than yours is to you? Will the country not survive without them … so therefore, they are the privileged few … the only ones who deserve to be protected? Or … maybe in their eyes, we are not all created equal in the eyes of the Lord. Like glorified Snake Oil salesman, Obama and his administration want to sell you the idea that only the government can keep you free and safe. But to Obama and his big-government socialist cronies, the truth hidden behind all the trappings is that to them, it is simply about obedience to their laws (legal or otherwise) and to your betters … a benevolent dictatorship! This is kind of funny in a way because Obama runs one of the most lawless administrations in the history of our country. The vigorously renewed liberal elite’s assault on the 2nd Amendment is being wrapped in the guise of protecting the American people from criminals and is capitalizing on the raw emotions brought on by recent shooting tragedies such the two that occurred in Aurora, Co and Newtown, CT. These were tragic events and I do not in any way belittle them. My heartfelt sympathy goes out to the victims and their families. However, the highly emotional context of this situation makes people very susceptible to government-sponsored knee-jerk reactions and quick fixes like blaming and banning the gun; while ignoring the shooters, their history, mental illness, etc. 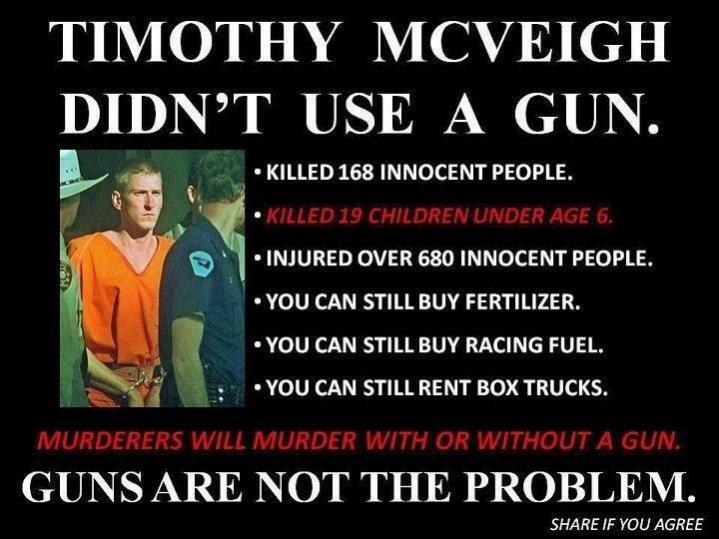 They also ignore the fact that most of these shooters obtained their weapons illegally! In the minds those evil or mentally ill in our society who murder the innocents among us; obedience to gun laws is the very last of their thoughts. Therefore, passing laws that take away the ability of law-abiding Americans to protect themselves against criminals is not the right answer, the smart answer, or the Constitutional answer. The hard reality is that, because the federal government refuses to do its job of protecting its citizens along our southern border, we have ranchers in Texas, New Mexico, California, and Arizona fighting pitched battles with Mexican Cartel drug runners and human traffickers. Obama’s administration even uses the sequestration, which is in reality a very, very minor cut in the growth of government spending, as a politically expedient excuse to cut funding for Border Patrol Agents. The real “irony” is that the drug runners and human traffickers are heavily armed with “assault weapons” provided by Obama, Eric Holder, and the ATF during operation “Fast and Furious!” So what is the solution according to Obama and the liberal elites? Simple … disarm the ranchers! Common sense would tell you that the venerable old double-barrelled shotgun suggested by good old Uncle Joe “gun-expert” Biden would be wholly inadequate to the task these ranchers are left on their own by the Anointed One to complete. 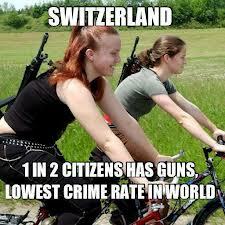 No, the real truth is, that for Obama and the ruling liberal elites, banning guns is the politically expedient answer. The truth is that, historically, all governments have feared individual freedom. God gave us freedom (the Right to Life, Liberty, and the Pursuit of Happiness) and the government systematically tries to take it away! I have always subscribed to the theory that all government is evil, and that the American form of democratic government is just the least evil form. The Founding Fathers knew that for this new Nation to survive, it needed a means to control its destiny, protect its citizens, and protect its interests. It needed a government of some form. They worked hard to design a government with a system of checks and balances to keep the government from getting to big and enslaving its citizens. Was it a perfect government? No! Just the best one going! But the Founding Fathers also understood that, by its very nature, government negates freedom and liberty; and that the bigger it gets … the more freedom it negates. That is why George Washington said that government is not reason or eloquence … it is force. And, that if the government gets its way, it would have a monopoly on force! However, individual freedom was the essential key that made America the unique, prosperous, and wonderful experiment it was. It was this idea; that personal freedom comes as a gift from God and thereby comes first … that made American special. This very same idea led to the end of slavery, to civil rights, and to modern ideas of equality for all people … disregarding race, gender, age, ethnicity, religion, creed, or sexual preference! Again … is it perfect? No! Did it take time? Yes! But it happened and it continues to improve! But, too many people have such short memories! These ideas did not come from government … they came from “We the People!” Americans usually had to fight the government to change the status quo! Democrats fought hard to keep slavery intact! Democrats fought hard against civil rights legislation! A Republican even had to call out the Nation Guard to see civil rights legislation enforced. As Ronald Reagan said, government is not the solution … it is the problem! To those of us who believe in the U.S. Constitution, this gun-debate is not about the law (or even about a new bunch of gun laws that good old Uncle Joe Biden say the government has no time to enforce anyway). To those of us who believe in the U.S. Constitution, this debate is about personal liberty and personal responsibility in a free society. And the real, ugly truth that Obama and liberal/socialist elites do not want Americans to know is that … it is the exercise of one specific personal freedom; the freedom to defend yourself and those you love when the police cannot and the government will not, and the freedom to use weapons to repel tyrants if they take over our government …that Obama, his big-government socialist thugs, and their doting Hollywood elitist buddies fear the most! Do you ever stop and wonder why communist dictators and fascist tyrants such as Fidel Castro or Hugo Chavez are so attractive to liberal elites such Jack Nicholson, Stephen Spielberg, Sean Penn, Danny Glover, Kevin Costner, Susan Sarandon, Oliver Stone, Chevy Chase, Courtney Love, and Harry Belafonte? And, that just perhaps, it is the same reason they are so equally enamored with Barack Obama? Simply put, government always compels, restricts, and takes away. Thomas Jefferson understood that when he wrote in the Declaration of Independence that “We are endowed by our Creator with certain inalienable rights.” According to Jefferson, the only reason the Founding Fathers created a “federal” government was to protect these same rights, and then, as a further protection … they hammered out the U.S. Constitution to keep the federal government contained. But there have always been those opposed to this idea. There are always those who like to rule those around them … and they often buy power by promising those who prefer, or are at least willing, to be ruled that they will take care of them with entitlements. Vote for me and I will give you a house, food stamps, free government schools, a free cellphone, free lunch, free government television programing, a free chicken in every pot, free this, free that. I ask you … what will happen when the government runs out of its “free Obama money,” and begins to implement austerity measures such as we saw in Greece and some European countries? Riots, looting, violence, crime! I will keep my guns thank you! Those in the ant-gun crowd cannot point to a single case when restricting the freedoms of law-abiding citizens has stopped criminals, the mentally ill, or the down-right-evil from killing innocent people. Criminals by their very nature do not obey laws, and the mentally deranged do not recognize any external restraints on their own behavior because they cannot distinguish between right and wrong; and cannot be reasonably expected to do so in the future either! Hence, the “not guilty by reason of insanity” plea! On the other hand, the American Revolution was successful in great part due to the fact that Americans were armed and did not fear the use of weapons. I am very sure King George III later wished he had stripped the colonists of the means to defend themselves. Had King George III and his Parliament passed and enforced the kinds of laws Obama, Hillary Clinton, Diane Feinstein, and a few others want to enact; laws that told them who among us owned guns, that limited the capacity of those guns, and limited the amount of ammunition one could possess … our Founding Fathers could and would have been hanged for treason! One of the true stories of the American Revolution which is not taught in our public schools is that the colonists actually had superior firepower to the Kings forces. British soldiers carried the standard issue smooth-bore musket, which propelled a lead ball (or several of them) less than 100 yards from the shooter with very little accuracy. The colonists, however, had the long gun(sometimes known as the “Kentucky” or “Tennessee” Long Rifle) which propelled a single lead ball up to 200 yards (about 2 times farther than the British soldier could shoot) and with much greater accuracy. It is no wonder that by 1781, King George III had lost enough men and money to surrender! During World War II, the American federal government constantly worried about a Japanese invasion of the West Coast. This impart led to the successful attack at Pearl Harbor. Politicians would not listen to front line commanders, and worried about their own safety! When, after the war was over, Japanese Admiral Isoroku Yamamoto was asked why Japan never invaded the U.S. He replied that they had determined it would be a suicidal attempt saying,” You cannot invade the mainland United States. There would be a rifle behind every blade of grass.” I always wondered why anyone in their right mind would be for gun bans and confiscation … seeing it was such a historic deterrent to the invasion of the United States! And … a great many Americans are alive today because they had the means to protect themselves from murders, rapists, home invaders, etc. Their stories are out there to! You just never hear about them from the Obama lap-dog media! The real lesson in all of this is that a free people cannot remain free very long by permitting the government to take their freedoms away … even when it is a temporary, popularly elected government that can later be unelected. Simply stated, the anti-American liberty faction, composed of Obama, his big government thugs, rich liberal/socialists, Hollywood elites, and their entitlement addicted voting block … want your guns! Of course, Gabby Gifford’s husband and other liberal elites get to keep theirs! Obama and his administration are deceptively trying to present this as some kind of benevlent big government action designed to protect the many law-abiding citizens from the few violent criminals by taking away the rights of the many law-abiding citizens (Does anyone else see the apparent flaw in this logic … or is it just me?). Obama will use any means, U.S. Constitution be damned, to create burdensome and intrusive registration laws, laws that restrict the capacity of weapons and quantity, and quality of ammunition, and their latest trick … laws that impose financial liability on law-abiding gun manufacturers and sellers for the criminal behavior of a few users to make gun ownership so hard and so burdensome, that law-abiding gun owners will simply roll over and give up. 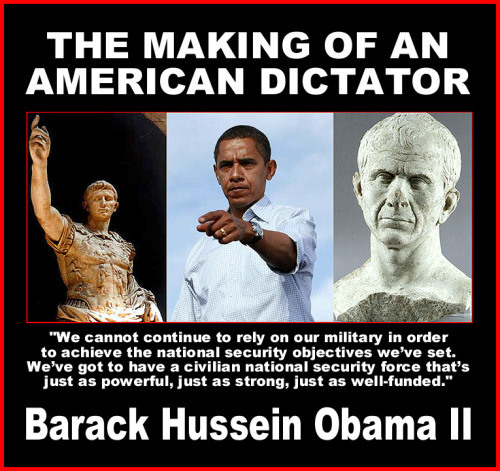 What Barack Obama, like King George III, does not understand is that the more you try to restrict freedom … the more you create the desire for it in. The more you tax an already overly taxed citizenry, the more resentment grows. This is what caused the first American Revolution. Hopefully, history will not repeat itself as it so often does. But then, perhaps this is why the Department of Homeland Security is so busily buying 1.6 billion bullets and 2,700 light-armored tanks! Previous PostUnnamed Officials Neither Confirm Nor Deny Unofficial Quote!Next PostObama’s “Really Hip” Unadulterated Foreign Policy Incompetence! I don’t believe in anyone “keeping me safe”. One keeps a dog safe by not letting it run in the streets. One keeps a cat safe, especially in my area, by not letting it outside to be eaten by a bear, coyote, or mountain lion. One keeps a child safe by keeping them from falling in the pool when they can’t swim. All of those have something in common, either they are too young to go swimming or they are “pets”. American human adults are not slaves. We are not pets. We are not subjects. We are not beholden to our government for anything. We OWN the government. We do not want government protection, unless it is from a foreign invasion, or when we travel to foreign lands; since that’s their JOB, they should do it.